How can we remain self-reliant when our cognitive faculties deteriorate? MEMO is an interactive calendar system that supports people with cognitive impairment through their daily life. 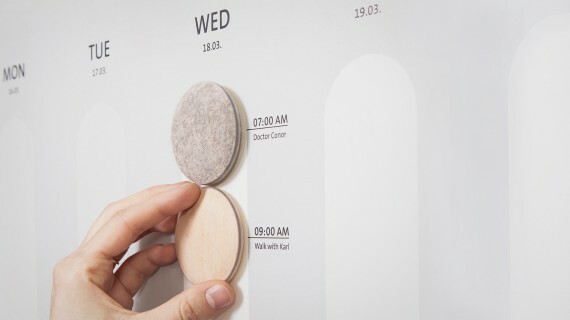 MEMO expands the design of a normal wall-calendar through the integration of small detachable magnetic objects. Each object represents a particular appointment. They can be removed from the E-Ink-calendar and carried anywhere with you. These portable objects trigger a multi-sensory memory process in advance of an appointment, even when the calendar is not close-by. The MEMO-objects are made of materials that the user associates with people they see regularly or events that take place on a regular basis. Playing music forms another part of the multi-sensory memory process. The music chosen will also be associated with a particular person or event. Both the music and the material should have a personal association for the user, in order to support thought processes in the brain. Light and vibration are additional signals that form part of the multi-sensory memory process. If it is, despite melody and material unclear, with whom and where the upcoming appointment takes place, you can rotate the MEMO-object and a recorded message of the event is played. If the memory process perceived as unpleasant, it can be stopped for a brief moment by pressing the MEMO-object. Pressing the object outside of a memory process, triggers the according melody of the MEMO-object. This playful way helps to internalize the link to the person or the event. The process has three separate phases, the initialization, the preparation and the departure phase, at which point, one should leave for the appointment in order to arrive on time. The music stops automatically on leaving the home in order not to draw attention. Short pauses serve to prevent the user from growing accustomed to the sensory signals. Even people with impaired hearing will perceive a change in the acoustic atmosphere. The duration of the intervals decreases incrementally in order to increase urgency. The timing of the intervals can all be individually adapted together with a relative or carer. The iteration of stimuli through various sensory organs, aids the internalization of memory rituals and events. This awareness of events can be enhanced through the repetition of activities with MEMO-objects such as placing and removing them from the calendar. Events do not remain abstract; instead they are experienced and understood on different levels. The MEMO-objects give the individual more independence in the absence of a carer. They on the other hand, can feel more confident that appointments will be kept, as a result of the shared rituals. Through MEMO people with cognitive impairment get the feeling of being worth living their own life and be accepted with their forgetfulness without being stigmatized. MEMO helps to structure daily life with personal preferences and without paternalization. Furthermore they get little constant companions, they can play with and enjoy on different levels. The multi-sensory interaction creates pleasure, activates attention, reduces stress of the disease and helps to not end up in apathy.